During the 2016 USPC Annual Meeting and Equine Symposium being held February 4-7 in Orlando, Florida, five individuals will be awarded the Founders’ Award, an honor reserved for Pony Club’s most worthy volunteers. This prestigious award is made each year to those who have made a significant contribution to Pony Club at the Local or Regional and National Levels over a period of 20 years or more. The recipients of the Founders Awards for 2015 are: Benjamin Hurt Hardaway III, Alita (Bunny) Hendricks, Nancy Ambrosiano, Michael Amos, and Judith Fannin. Benjamin Hurt Hardaway III. Ben was born in Columbus, Georgia and graduated with a B.S. in Civil engineering at Virginia Military Institute. He served in WWII in Armored Cavalry and was awarded the Bronze and Silver Star. Ben married Sarah McDuffie in Columbus, Georgia in 1945 and they had four children, Sarah, Mary, Susannah and Ann who were all active members of Midland Foxhounds Pony Club, which Ben and Sarah founded. 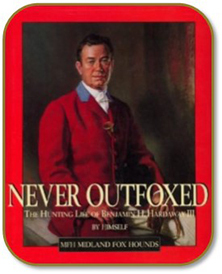 Pictured is a book cover written by Ben about his love of foxhunting. Ben is a Life Member of USPC and served on the United States Pony Clubs Board of Governors from 1957 to 1962 with a second term in 1968 to 1970. He and his wife Sarah were sponsors and Founders of Midland Pony Club in Alabama and he was also DC from 1963 to 1965. Ben served as a National Examiner in the late 60’s as well as the Foxhunting Committee Chair from 1967 to 1974 as well as the Nomination Chair in 1975. Ben had many hobbies such as Foxhunting, bird shooting, racquetball and tennis. He was the Joint Master of the Midland Fox Hounds and past President of the Masters of Foxhounds Association of America. He was awarded the Honorary Member of the Masters of Foxhounds Association in England (for his expertise in the Breeding of Foxhounds) which was a great honor. Ben is known for the creation of the Hardaway Crossbreds which are in 80 percent of the Crossbred packs in America today. The lines that he helped to create have been in the kennels for 50 years and his son-in-law, Mason Lampton believes strongly in keeping a certain amount of these lines going as Joint-Master of Midland Hunt. Ben was inducted into the Huntsman’s Room at Morven Park in May of 2009 and also inducted to the Chattahoochee Sportmans Hall of Fame in February 2010. Alita (Bunny) Hendricks. Bunny joined the Woodlawn Pony Club, Virginia Region at age 11 and then moved to Difficult Run Pony Club the next year. In August of 1973 Bunny earned her A just weeks after her 16th birthday. Her family by then lived in Ohio and started Mad River Valley PC (Tri State Region) but in 1974, the family returned to Virginia. Bunny transferred to Suncoast PC in the Sunshine Region when she became a student at the University of South Florida in Tampa. She earned her BA degree in Elementary Education at USF and taught elementary school for 21 years in Hillsborough and Pasco Counties in Florida. 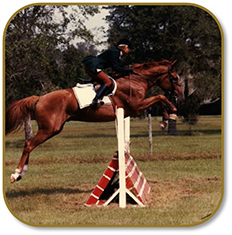 Bunny was a regular volunteer Instructor for Suncoast Pony Club in Florida as a new A from 1975 – 1977. Duties included teaching regularly scheduled meetings, (mounted and HM) and coaching rally teams (D Teams and C and up Teams), teaching camps, and rating preps D-A. Additionally, Bunny designed courses for SPC Fundraising Horse Shows. Her regional service in the Sunshine Region has been very extensive. Bunny is a current National Examiner and Chief Horse Management Judge but has been the regions HMO and RIC (three times), presented numerous H-B and H-A preps and Standards and Certification Clinics along with numerous volunteer positions at the regional rallies. Bunny’s national service began in 1982 when she became a National Examiner and then as an educator she was on the Written Test Committee and soon became the Chair. She has been the chair of the D to C-2 Program and C-3 Program, plus years of being on the NE Testing Committee and HM Committees. 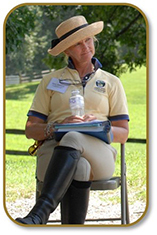 Bunny has worked many Festivals as a riding instructor and helped with several workshops at the USPC Annual Meeting over the years. She is proud parent of a D-1 dropout, her Eagle Scout son, Jon. Jon is currently working on his Masters in Film Studies at the University of South Florida and is a Teaching Assistant there as well. Bunny has been married to husband Mark for 35 years. Mark has always been very supportive of Bunny in her “horse habit” putting up with her horses at home and the great amount of travel involved with teaching Pony Club Preps, Camps and being a CHMJ for many rallies over the years. Nancy Ambrosiano. Nancy joined Charleston Pony Club in South Carolina when she was 6 years old. The family began hunting in Virginia Beach with Princess Anne Hunt, Nancy rode in the field and was a whipper-in. Nancy’s family helped found Princess Anne Hunt Pony Club where she achieved her D to the B level. Nancy decided to wait a year to go off to college and prepare for her H-A and A and after being a working student for Betty Hallett and working with Jan Royce Conant (another Founder honoree) she passed both tests and participated in the Visiting Instructors program in its early days as well. Nancy attended the College of William and Mary where she met her future husband, John Ambrosiano, a physics PhD candidate and transferred with him to the University of Alaska, Fairbanks. After his post-doc, they moved to George Mason University, from where Nancy graduated with a degree in English. Nancy has taught Pony Clubs in Connecticut, New York, Virginia, North Carolina, and then moved to California where she raised a family and Nancy worked as a reporter and then a science writer at Lawrence Livermore National Laboratory. After 7 years in Livermore they moved to Los Alamos, New Mexico where they belonged to Sangre de Cristo PC, then founded the Los Alamos PC where her daughter Laura received her C-3. Nancy has been active with the USPC Quiz Committee and has helped in judging classroom, barn and megaroom at Champs West and Festival several times. She has chaired Communications, and served on Governance, Regional Administration, Marketing, National Youth Congress and Foxhunting committees. 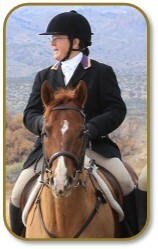 Nancy is president and first field master for Caza Ladron Hunt in Santa Fe, New Mexico. She rides a hot little chestnut gelding, Thomas and dares you to keep up as they chase coyotes across the desert. Michael Amos. Originally from Beech Grove, Indiana, Mike studied at Indiana State University and started a career in public education in Indiana. He particularly enjoyed coaching football, wrestling, and track. This eventually led to secondary school administration as a principal and assistant school superintendent in Indiana and Cincinnati, Ohio. Daily working closely with kids, parents, organizations, and the public gave Mike skills quite helpful for Pony Club and its mission. His daughter, Krista, joined the Walnut Creek Pony Club in 1992, and like all Pony Club parents, Michael’s first Pony Club jobs were hauling, feeding, mucking, raking, painting, or constructing jumps. Mike was not disposed to sitting around waiting and watching, but becoming involved with whatever Pony Club needed. 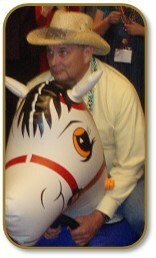 Mike became the Treasurer and Joint DC of Walnut Creek Pony Club in Cincinnati and he was an all-around volunteer at the MidSouth mega-rally in 1993, in Lexington, Kentucky. This inspired him to become more involved. So in 1994, he became an assistant Horse Management Judge and later a Chief HM Judge, leading to some years of travels in many other regions as a Chief HM judge. From 2000-2016, he served on the Board of Governors, being the Parliamentarian for President Margo Leithead, and has helped in this role over the years with other presidents. He was VP of Regional Administration for two terms and Secretary for one term, having the pleasure of working with many different presidents: Emsie M. Parker, Larry Byers, Margo Leithead, Art Kramer, Tom Adams, Dan Murphy and current President, Nancy Pitman. His greatest accomplishments in Pony Club were helping implement the age extension, creating the MidWest Championships, presenting workshops on conflict resolution, and organizing regional leadership and training camps. He now loves to ride his quarter horse, Bear, co-owned with his daughter, Krista, and enjoys watching his grandchildren learning to ride. Mike considers it a privilege to have been able to serve with and get to know a group of people from all over who are compassionate and committed to the Pony Club kids. He truly believes that Pony Club has enriched his life and the lives of not only the kids, but its volunteers. Judith Fannin. Judith started riding western at age 10. She completed mostly in barrel-racing and western classes, including reining pattern, until about age 14. Then she was introduced to dressage and jumping and was hooked! Her husband (Larry) really thought the horse thing was just a phase and would soon be out of our lives but he bought 10 acres where she started teaching hunt seat and dressage. She became involved with Clearwater Pony Club as a sponsor and loved the teaching part. Judith was then showing at the ‘A’ shows in the green and regular working hunters, as well as doing first level dressage. Janet (Judy’s daughter) joined Suncoast Pony Club as they needed a 4th member to complete a rally team even though she was then jumping 3’6-3’9 at rated shows; while younger sister, Valerie, 10 joined as a D-1. Judith became the DC of Suncoast, and after several years was asked to become Regional Supervisor of the Sunshine Region, holding the position of RS and VRS for several years. In 1987, both Judith and Janet began the process of becoming National Examiners. At the time, we were the only mother-daughter on the NE list. Janet eventually became her boss for a 3-year period when she became head of National Testing. After 24 years as an NE, (now retired), Judith still loves the challenge of working with the young riders, and the camaraderie of the incredibly knowledgeable national examiners. In the midst of all this “horsey business”, Larry and Judith managed to buy a 32’ cruiser. They spend time taking trips to the Bahamas, Key West and up the East coast. Judith and Larry still have the farm in Brooksville where they put on six hunter-jumper and dressage horse shows, and two horse trials every year, besides hosting the Fox Hollow Pony Club every month. Judith thanks USPC for standing for so many ideals. It has helped make her life not only challenging, but filled with wonderful people, all while we enjoy God’s incredible gift: the horse.